Why UTRGV? UTRGV was a chance for me to finish up my basics and potentially be able to transfer elsewhere to finish up my advance coursework. That reasoning changed through the opportunities that were granted to me by the university and the student to teacher ratio that the campus provides. Over time, I found that UTRGV has everything I need to succeed with a supportive community like no other. What made you decide on your current major? Growing up my parents always placed an importance on being smart when it comes to your financial situation and understanding when certain investments are worth taking. This mentally has influenced many of my decisions and it’s one of the primary reasons why I chose this major. I also decided to choose this major so I can potentially help others be smart about their money down the line. What are your plans after graduation? Law school has always been a major goal for me and after receiving a bachelor in Finance, I hope to be accepted into the law program at the University of Texas at Austin. What are you involved in on and off campus? 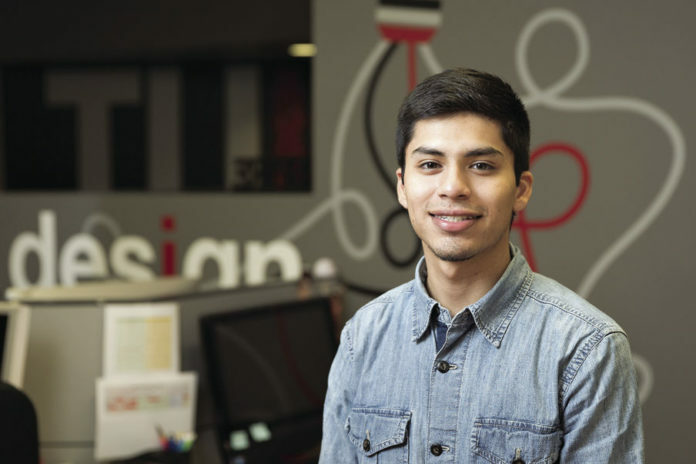 I I am a Graphic Designer with UTRGV Marketing and Creative Services and I am also a member of the National Society of Leadership and Success. Aside from my work on campus, I am also a youth leader at Life Tabernacle-Sebastian, where I have had the opportunity to work with other young people for the betterment of themselves and others. What is your biggest accomplishment to date? Besides the academic accolades that I’ve had the pleasure of receiving, my greatest accomplishment to date has to be the success of a mentorship I have recently started in my community. For me, being able to see the visible fruits of your labor through the success of a person you’ve been mentoring matches any accomplish any of us can have. What advice do you have for future students? Don’t be afraid to fail. Failure is simply the restart button we hit in order to try again.